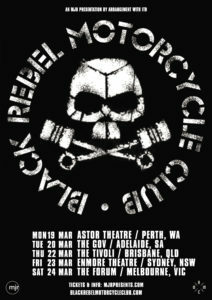 BlackRebelMotorcycleClub Blog: BRMC Australia Spring Tour ! BRMC Australia Spring Tour ! AUSTRALIA! We’re excited to announce that we are heading down under in 2018! Tickets go on-sale August 3rd at 9 AM local time!